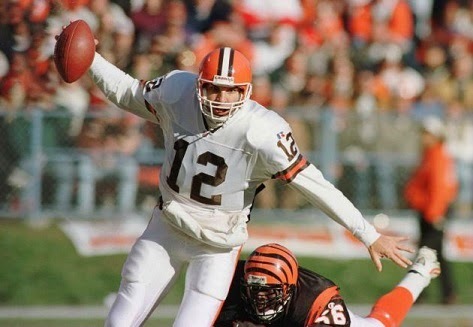 On March 31, 1993 free agent QB Vinny Testaverde, previously with the Tampa Bay Buccaneers, signed a one-year contract with the Cleveland Browns. He was to back up Bernie Kosar, a quarterback he had understudied at the University of Miami nearly a decade before. At 29, Testaverde and Kosar were the same age (in fact, their birthdays were just 12 days apart – the studious Kosar graduated from college a year early and Testaverde entered late). “Cleveland wanted me, Tampa would have settled for me,” said Testaverde in discussing his decision. The Bucs had reportedly offered a deal to Pittsburgh QB Neil O’Donnell prior to Testaverde choosing to go with Cleveland (O’Donnell remained with the Steelers and Tampa Bay ended up going with Craig Erickson, a rookie backup in ’92 who was also a product of Miami). Cleveland Head Coach Bill Belichick welcomed the depth that his new quarterback brought to the position. The Browns ran into trouble in ’92 when Kosar and backup Todd Philcox were both injured. Former Bears QB Mike Tomczak had been signed to fill in, but the team lost six of its last nine games to finish with a 7-9 record. Testaverde had won the 1986 Heisman Trophy and Tampa Bay made him the first overall pick in the ’87 NFL draft. With his outstanding physical tools, at 6’5” and 235 pounds and including a strong arm, expectations were high for him, but his six seasons were filled with adversity. 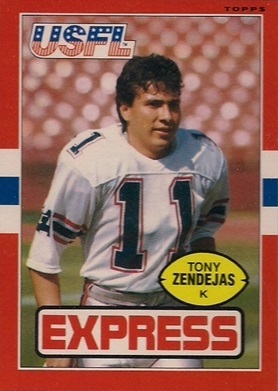 He took over as the starting quarterback late in the strike-interrupted 1987 season and proceeded to lead the league in interceptions thrown over the course of the next two years, including 35 in 1988, still the second-highest total in NFL/AFL history. While he could be a precise passer and was fairly mobile, Testaverde also tended to deal poorly with adversity and could make bad plays as a result. He left the Buccaneers as the team’s all-time leader with 14,820 passing yards. However, Tampa Bay went 24-48 with him as the starting quarterback. While mediocre coaching and lack of a strong supporting cast certainly played a role, Testaverde drew criticism regarding his work ethic and toughness under pressure. In many ways, he was the exact opposite of Kosar, who overachieved with less impressive skills and had great intelligence and leadership ability. As anticipated, Kosar started the ‘93 season but struggled and Testaverde performed ably in relief outings. The Browns had a 5-3 record when Coach Belichick, in a stunning decision, released Kosar – all the more surprising because Testaverde was injured and Philcox had to step into the lineup for four games (three of them losses on the way to another 7-9 record). When Testaverde returned, he continued to play well and had his best pro season to date, throwing more touchdowns (14) than interceptions (9) for the first time and compiling an 85.7 passer rating. His 91.3 completion percentage on a 21-of-23 performance against the Rams was a NFL record at the time. He was rewarded with a contract extension and the starting job for ’94. In 1994, the gamble appeared to pay off when the Browns went 11-5 and reached the playoffs. Still, operating behind an offensive line that allowed only 14 sacks, Testaverde reverted to form with a negative TD pass-to-interception ratio of 16 to 18 and was especially unimpressive in fourth quarter pressure situations. But he was a winning quarterback in his first postseason game and drew praise for development as a leader. Hopes for further improvement in 1995 were dashed when the team fell to 5-11 after getting off to a 3-1 start. The announced move of the franchise to Baltimore for ’96 was a significant distraction, but Testaverde continued to have difficulty with consistency. While he gave up only 10 interceptions, tossing 17 touchdown passes, he was also benched for three games in favor of backup Eric Zeier. The team, now called the Baltimore Ravens, had a new offensive-minded head coach in Ted Marchibroda for 1996 and Testaverde put up big numbers, including 4177 yards and 33 TD passes, and was named to the Pro Bowl for the first time. But the record was only 4-12 and, after a lesser performance in ’97, Testaverde was let go. In five seasons with the Browns and Ravens, Testaverde threw for 14,403 yards and 98 touchdowns while giving up 71 interceptions. It was improvement, to be sure, but the inconsistency remained and only once during that period did the team finish with a winning record. Testaverde went on to have an outstanding year with the New York Jets in 1998, followed by a season in which he went down for the year in the opening week and then a 2000 campaign where he led the NFL in interceptions for the fourth time. His career would ultimately come to an end in 2007 at age 44, and while there were many accomplishments, there was also the up-and-down pattern of performance that caused Testaverde’s failure to achieve the heights that were anticipated when he came into the league in 1987. George won the 1995 Heisman Trophy after a year in which he rushed for 1927 yards, gained 2344 yards from scrimmage overall, and scored 25 touchdowns. He was chosen by the Oilers in the first round of the ’96 NFL draft (14th overall) and moved directly into the starting lineup. Oilers went 8-8 to finish fourth in the AFC Central. 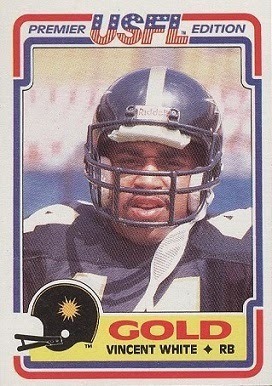 With the team shifting to Tennessee in 1997, George rushed for 1399 yards and was selected to the Pro Bowl for the first of four straight seasons. A power runner with outstanding agility and speed enough for breakaway runs, he didn’t catch many passes in his first two years but became more involved as a receiver out of the backfield thereafter. George rushed for 1304 yards and caught 47 passes for 458 more as the team, now called the Titans, won the AFC title in 1999 and was a consensus first-team All-NFL selection in 2000 as he achieved career highs with 1509 yards, on a league-leading 403 carries, and 50 catches. However, after five years of never missing a game, foot surgery cut into his offseason conditioning regimen and he had an off-year in 2001, running for 939 yards while averaging just 3.0 yards per carry. While he came back to run for 1165 yards and score a total of 14 TDs in ’02, he was clearly in decline and, after one more season with the Titans, moved on to the Dallas Cowboys for his last year in 2004. 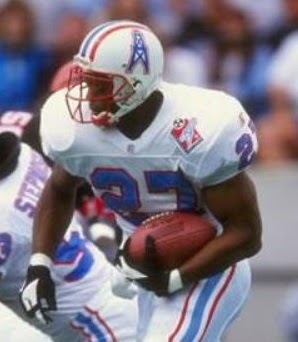 Overall, George rushed for 10,441 yards (10,009 with the Oilers/Titans) on 2865 carries (3.6 avg.) and caught 268 passes for 2227 yards, scoring a total of 78 touchdowns. The Washington Federals had endured tough going in the first three weeks of the inaugural United States Football League season, losing all three of their games, including the most recent thanks to a late field goal. On March 27, 1983 they hosted the Michigan Panthers, who came into the contest at 1-2. The Federals, coached by Ray Jauch, had a good rookie running back in Craig James, but he was already sidelined with an injury. WR Joey Walters was a dependable receiver, but quarterback was unsettled with another promising first-year play, Mike Hohensee, injured and veteran NFL backup Kim McQuilken taking his place. Michigan had a big-name rookie of its own, WR Anthony Carter, who was off to a slow start and a less-heralded first-year quarterback in Bobby Hebert. LB John Corker already had five sacks, but Head Coach Jim Stanley’s team was still coming together and, following a low-scoring opening win, was struggling. There was an extremely disappointing crowd of 11,414 fans in attendance on a rainy day at RFK Stadium. The Federals got on the board first, just three minutes into the contest, with a 32-yard field goal by Obed Ariri. That was it until midway through the second quarter when Washington extended its lead on a pass from Kim McQuilken to WR Mike Holmes that was good for a 40-yard touchdown. The Panthers responded by driving 81 yards in 12 plays, culminating in a TD pass from Bobby Hebert to Anthony Carter that covered 33 yards. It was Carter’s first pro touchdown and, with Novo Bojovic adding the extra point, Washington’s lead was narrowed to 10-7. In the waning seconds of the first half, the Federals scored another touchdown on an eight-yard McQuilken toss to Joey Walters. Ariri missed the extra point, but the home team took a 16-7 lead into halftime. Late in the third quarter, the Panthers came through with a big play to once again cut into Washington’s lead. Hebert connected with WR Derek Holloway for a 69-yard TD, although Bojovic also failed to convert the extra point. Still, it was a three-point contest heading into the fourth quarter. It was almost enough for the Federals, but Bojovic tied the game with a 43-yard field goal as time expired in regulation. The Federals had the first possession in overtime and drove 72 yards in six plays, the last of which was a pass from McQuilken to Walters, who outdistanced the coverage on a down-and-in pattern for a game-winning 23-yard touchdown at 2:43 into the extra period. Washington finally broke into the win column by a final score of 22-16. The Panthers had the edge in total yards (326 to 314) and each team recorded 20 first downs. Most of the yards came through the air as neither club mounted much of a ground attack (the Federals had the edge at 48 yards to 42). Michigan recorded six sacks (five of them by John Corker, on his way to leading the USFL in that category) but also turned the ball over seven times (six on fumbles) to just one turnover suffered by Washington. Kim McQuilken had a big day as he completed 24 of 48 passes for 324 yards and three touchdowns with one interception. Mike Holmes caught 6 passes for 124 yards and a TD while Joey Walters also contributed 6 receptions, gaining 99 yards and scoring twice. RB James Mayberry was Washington’s leading ground gainer with 25 yards on 10 carries while RB Eric Robinson was held to just 22 yards on 17 attempts, although he caught 5 passes for 37 yards. 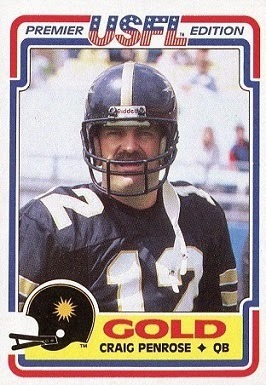 For the Panthers, Bobby Hebert was successful on 22 of 44 throws for 292 yards and two TDs, tossing one interception. WR Frank McClain led the receivers with 6 catches for 76 yards and Anthony Carter added three receptions and 51 yards, including a touchdown. RB Ken Lacy ran for 35 yards on 7 attempts. The win for the Federals did not signal a turnaround. They were thrashed by the powerful Philadelphia Stars the next week and went on to finish at the bottom of the Atlantic Division with a 4-14 record. Michigan’s fortunes did improve dramatically, however. The Panthers lost again to drop into a 1-4 hole before reeling off six straight wins on the way to a 12-6 tally, best in the Central Division. 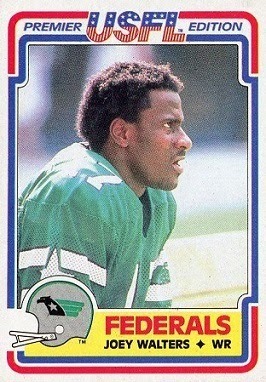 They went on to win the first USFL Championship. Kim McQuilken saw most of the action at quarterback for the Federals, throwing for 1912 yards with seven touchdowns against 14 interceptions in what would be his last pro season. Joey Walters remained productive as he caught 63 passes for 959 yards (15.2 avg.) and six TDs. Payton was a two-time All-American in college, rushing for 3563 yards and 66 touchdowns, and his 464 points set a NCAA record. Chosen by the Bears in the first round of the 1975 NFL draft, he played hurt during his rookie season (and missed the only game of his career) as he accumulated 679 rushing yards. Bears went 7-7 to finish second in the NFC Central, their best record since 1968. Payton followed up his breakout 1976 season by rushing for a league-leading 1852 yards, including a then-record 275 in a single game in ’77. He garnered MVP honors as well as being a consensus first-team All-NFL selection for the second year. Payton continued to be not only a highly productive rusher for a total of 13 seasons in the NFL, but was also an outstanding blocker and receiver out of the backfield, as well as an accomplished passer on option plays (he was even the club’s emergency quarterback). He led the NFC in rushing for five straight years, despite being part of a lackluster offense that had opposing teams keying on him, and totaled 10 thousand-yard rushing seasons. Payton was a consensus first-team All-Pro five times and was chosen to nine Pro Bowls. The even-tempered player known as “Sweetness” was also an unselfish team leader and hard worker, and was popular not only with Bears fans, but throughout the league. 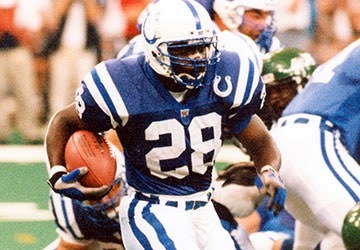 He retired as the NFL’s all-time leading rusher with 16,726 yards and also topped the list in carries (3838) and rushing TDs (110); his total of 125 touchdowns ranked second. Payton also caught 492 passes for 4538 yards and exceeded 2000 yards from scrimmage in four seasons. 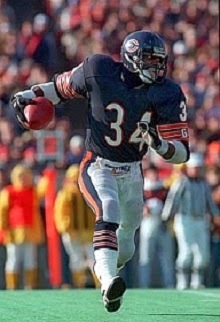 The Bears retired his #34 and he was inducted into the Pro Football Hall of Fame, Class of 1993. 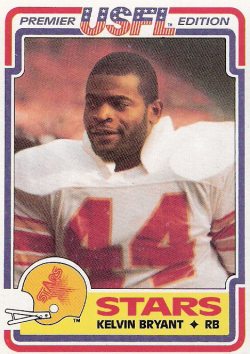 The Philadelphia Stars were off to a 2-0 start in the inaugural United States Football League season as they took on the Birmingham Stallions on March 21, 1983. Rookie RB Kelvin Bryant had quickly established himself as the key player in the ball control offense that was directed by QB Chuck Fusina while the defense was proving to be very tough and was coming off a shutout of the New Jersey Generals. 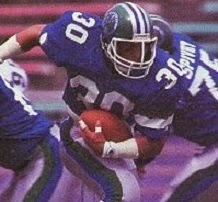 The Stallions were 1-1, having won the USFL’s first overtime game the previous week. Coached by Rollie Dotsch, formerly an assistant with the NFL Steelers and used to winning, Birmingham invested heavily in young players, most notably QB Reggie Collier, a mobile rookie out of Southern Mississippi who had signed a big contract to start right away in the new league. The Stars took the early lead by driving 73 yards in 10 plays on their first possession. RB Allen Harvin ran around left end for the final two yards and a touchdown and David Trout added the extra point. The teams traded interceptions, following which Birmingham came back with a score later in the opening period. The big play was a pass from Reggie Collier to WR Sylvester Moy that covered 45 yards to the Philadelphia 13. Collier carried for a four-yard TD to cap the five-play, 58-yard series and Scott Norwood tied the game with the extra point. Less than two minutes into the second quarter, Trout put the Stars back in front with a 23-yard field goal, finishing off a 51-yard possession that took seven plays. The 10-7 lead held up through the remainder of the half. Philadelphia started the third quarter with Harvin returning the second half kickoff 67 yards to the Birmingham 21. Five plays later, and on his fifth straight carry, Kelvin Bryant scored a touchdown from a yard out and Trout added the PAT to make it a ten-point margin. To make matters worse for the Stallions, a hip pointer knocked Collier out of the game for the second half. Still, with backup QB Bob Lane behind center, the home team responded by driving from their 41 to the Philadelphia two. The Stars held at that point but Norwood made it a seven-point game with a 19-yard field goal. Philadelphia was unable to build on its lead and Lane nearly led the Stallions to a potential tying touchdown late in the fourth quarter. Birmingham had a first down at the Philadelphia 12, but three straight passes fell incomplete to end the threat and seal the 17-10 win for the Stars. The Stallions had the edge in total yards (312 to 227) and first downs (20 to 13), with 200 of Philadelphia’s total coming on the ground. However, Birmingham also turned the ball over three times, to one suffered by the Stars. Kelvin Bryant had his biggest game yet, rushing for 177 yards on 27 carries that included a touchdown. Chuck Fusina had a rough outing, completing 8 of 15 passes for just 56 yards and being picked off once. WR Willie Collier was the team’s most productive receiver with 28 yards on two catches. FS Mike Lush intercepted two passes on defense. For the Stallions, Reggie Collier was successful on 7 of 14 throws for 95 yards and tossed two interceptions before having to leave the contest. Bob Lane was 15 of 24 for 134 yards and had one pass intercepted. Sylvester Moy had 8 catches for 115 yards (he had just three more catches and 88 more yards over the remainder of the season). RB Ken Talton led the rushers with 37 yards on 8 attempts and RB Billy White contributed 31 yards on his 14 carries. The win over the Stallions set the Stars up for a battle of unbeaten against the Tampa Bay Bandits the next week, which they lost, but they recovered to go 15-3, top the Atlantic Division, and advance to the USFL Championship game, where they fell to the Michigan Panthers by two points. The defense continued to be a key to the team’s success as well as Kelvin Bryant, who rushed for 1442 yards and was named MVP by the league. Birmingham finished at the bottom of the Central Division with a 9-9 record. 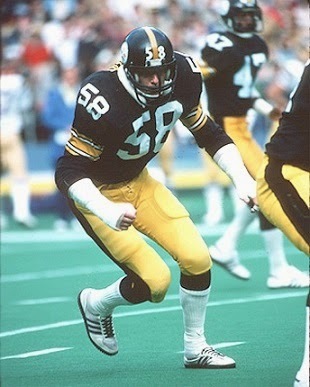 Lambert was a two-time All-Mid-American Conference linebacker in college and the Steelers chose him in the second round of the 1974 NFL draft. Injuries to MLB Henry Davis opened an opportunity for Lambert to start right away, and his addition was to make an already sound defense more complete. The Steelers won the Super Bowl and Lambert followed up his outstanding rookie season by gaining Pro Bowl recognition for the first of nine straight seasons in 1975, which also ended in a NFL Championship. Steelers went 10-4 to finish first in the AFC Central Division while leading the NFL in fewest yards allowed (3323), fewest rushing yards allowed (1457), and fewest points allowed (138). Won AFC Divisional playoff over Baltimore Colts (40-14). Lost AFC Championship to Oakland Raiders (24-7). Lambert followed up with his third straight Pro Bowl season in 1977. A terrific run-stuffer with outstanding range and the ability to drop back effectively into pass coverage, he became a key contributor to the “Steel Curtain” defense that helped make the Steelers a contender for the rest of the decade and included two more Super Bowl victories. In addition to his Pro Bowl selections, Lambert received consensus first-team All-NFL honors six times – including five consecutive from 1979 to ’83 – and had at least some first- or second-team recognition in two other years. He missed only six games due to injury in his first ten seasons (three of them in 1977), but a severe toe injury forced Lambert’s retirement following the 1984 season. Overall, he intercepted 28 passes and recovered 17 fumbles. Lambert was inducted into the Pro Football Hall of Fame, Class of 1990. Three other players drafted by the Steelers in 1974 – Lynn Swann, John Stallworth, and Mike Webster – would also be enshrined in Canton. A single-wing tailback in college, Graham chose to sign with the Browns of the new AAFC rather than the NFL Detroit Lions, who had drafted him in the first round in 1944, after coming out of the Navy. An outstanding athlete, he first played pro basketball before joining the Browns for the 1946 season. Mobile and an accurate passer, Graham threw for 1834 yards as a rookie and led the AAFC with 17 TD passes as the Browns won the league championship. He was the league’s MVP for the first time in ’47 as he led the AAFC in overall passing as well as completion percentage (60.6), yards (2753), TD passes (25), and yards per attempt (10.2). Graham was co-MVP with San Francisco’s Frankie Albert in ’48, a season in which he once more led the AAFC in passing yards (2713) while tossing another 25 TD passes and the Browns went undefeated. The Browns won the AAFC title for the fourth straight year in 1949, and Graham led the league in passing yards (2785) and yards per attempt (9.8). While no MVP was awarded by the league, he was a consensus first-team All-AAFC selection. Graham and the Browns moved to the NFL in 1950 and kept up their winning ways by achieving another championship. Graham was selected to the Pro Bowl. He was named league MVP by UPI in ’51 as the Browns went 11-1, although they lost the Championship game to the Rams. In 1952, Graham led the league in pass attempts (364), completions (181), yards (2816), and TD passes (20), as well as interceptions (24), and was once again named to the Pro Bowl. He received MVP honors from UPI again in ’53 after leading the league in passing yards (2722), yards per attempt (10.6), and completion percentage (64.7) and, while the Browns lost the NFL Championship game for a third straight year, they returned to the top in 1954 as Graham again led the NFL in completion percentage (59.2). He retired at that point, although when the Browns had difficulty in the 1955 preseason, he was coaxed back into action for one more year. Browns went 9-2-1 to finish first in the NFL Eastern Conference while leading league in scoring (349 points) and touchdowns (45). Won NFL Championship over Los Angeles Rams (38-14). Graham retired for good following the 1955 season. Altogether, over 10 seasons (four in the AAFC, 6 in the NFL) he averaged 9.0 yards per attempt (a record 8.6 in the NFL alone) while throwing for 23,584 yards (10,085 in AAFC, 13,499 in NFL) with 174 TDs (86 in AAFC, 88 in NFL). He also ran for 882 yards and scored 44 TDs, with a high of 8 in 1954. 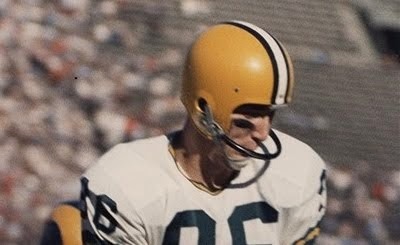 Graham was a first-team All-league selection three times in the AAFC as well as three more times in the NFL and was chosen for the first five Pro Bowls. Perhaps most significantly of all, he quarterbacked Cleveland to a championship game in all ten years, winning seven of them. 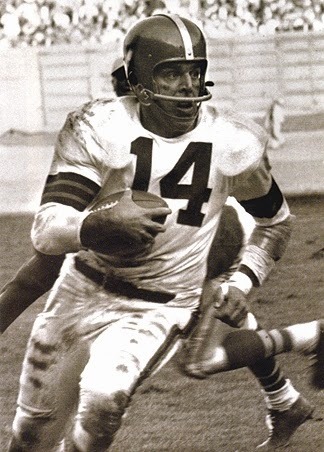 The Browns retired his #14 and he was inducted into the Pro Football Hall of Fame, Class of 1965. 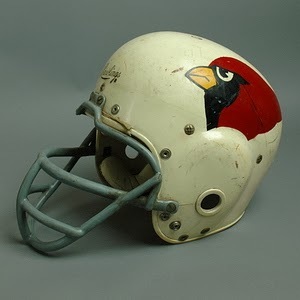 On the evening of March 13, 1960 the NFL approved the transfer of the Chicago Cardinals franchise to St. Louis. The owners agreed to the move upon two conditions. First, a satisfactory lease agreement had to be worked out with Busch Stadium, which was owned by the major league baseball Cardinals, as well as arrangements for television coverage (as anticipated, these were not problematic conditions. A new stadium, which would come to be Busch Memorial Stadium, was in the planning stages and was finally available in 1966). The team’s managing director, Walter Wolfner, strongly denied that a move was imminent right up to the day of the vote. He indicated afterward that the league had unexpectedly agreed to meet certain conditions that made the franchise shift possible. The NFL agreed to pay the team $500,000 to help defray the costs of the relocation, which included paying off the lease for use of Soldier Field. The Bears were especially willing to assist with the cost in anticipation of increased revenue due to the freeing up of the Chicago territory. While sentimentalists were sorry to see the move of the league’s oldest franchise, which had such long ties to the Windy City, the club had long played second fiddle to the more successful Bears. The Cardinals had Chicago roots dating back to 1898, when they began life as an amateur community team called the Morgan Athletic Club. From there they became the Racine Normals, due to their venue being Normal Field on Racine Avenue, and then the Racine Cardinals after obtaining a supply of faded maroon jerseys from the University of Chicago. The team disbanded and reorganized on two occasions and joined the fledgling NFL (then the American Professional Football Association) in 1920, quickly becoming known as the Chicago Cardinals. While the Cardinals had sporadic success, winning NFL titles in 1925 and ’47, for the most part they quickly fell behind the rival Bears, who won far more regularly. The club was bought by Charles W. Bidwill in 1933, and by the late 40s he had begun to assemble a winning squad that featured the “Million-Dollar Backfield” of QB Paul Christman, FB Pat Harder, and halfbacks Charley Trippi and Elmer Angsman. But he died before the championship-winning season in 1947 and his widow, Violet, married businessman Walter Wolfner two years later, who became managing director in 1951. Organizationally, the Cards floundered in the 1950s, putting together just one winning season. Attendance was poor and not helped by the move from Comiskey Park to Soldier Field in 1959, also playing two games in Bloomington, Minnesota, a potential NFL market (the Vikings arrived on the scene in 1961). The Wolfners turned down suitors willing to buy the franchise (two of whom, Lamar Hunt and Bud Adams, went on to found the American Football League), but they were losing money. With a study showing that St. Louis was a viable candidate to field a NFL team, the decision was made to relocate. Additionally, a St. Louis brewer named Joe Griesedieck bought a ten percent interest in the club. The team’s fortunes immediately improved on the field. After having finished at the bottom of the Eastern Conference with a 2-10 record in 1959, the Cardinals were 6-5-1 in their first St. Louis season. They were the NFL’s top rushing team, with star HB John David Crow leading the way with 1071 yards and second-year split end Sonny Randle led the league with 15 receiving touchdowns among his 62 catches. The defense was greatly improved and included DE Leo Sugar, DT Frank Fuller, plus an established star safety in Jerry Norton, who was also an excellent punter, and Larry Wilson, a rookie who would go on to a Hall of Fame career, in the other spot. Violet Wolfner died in 1962 and a legal battle ensued between her sons from her marriage to Charles Bidwill, Charles W. Jr. (aka Stormy) and Bill, and the pugnacious Wolfner who contested the will leaving the bulk of her estate – including the majority ownership in the Cardinals – to the brothers. The nasty legal battle was finally settled out of court. Stormy ran the team until selling his interest to Bill in 1972. Meanwhile, on the field there was difficulty at quarterback, and the acquisition of 31-year-old Sam Etcheverry, a legendary player in Canada, failed to resolve the issue when it was found that his arm was worn out. However, in 1962 a promising young quarterback from New Mexico State named Charley Johnson took over and, in 1963 and ’64, the Cards exhibited a productive offense and contended in the Eastern Conference. Randle, in combination with flanker Bobby Joe Conrad, continued to excel and the offensive backfield was deep enough to withstand injuries. Wally Lemm had been grabbed away from the AFL’s Houston Oilers in ’62 to become the head coach, with encouraging results. However, the Cardinals failed to break through to the postseason. The team would not do so until 1974, under offensive-minded Head Coach Don Coryell, but he left after five years and two non-winning postseason appearances, frustrated by the team’s continued organizational failings under Bill Bidwill. Ultimately, the relocation to St. Louis that began with such promise of success soured badly. Bidwill chose to be his own general manager, too often with unfortunate results. Along with some notable highly-drafted busts such as QB Steve Pisarkiewicz, WR Clyde Duncan, and kicker Steve Little, there were plenty of talented players along the way. In addition to those named previously, notable among them on offense were quarterbacks Jim Hart and Neil Lomax, running backs Terry Metcalf and Ottis Anderson, wide receivers Mel Gray, Pat Tilley, Roy Green, and J.T. Smith, linemen Dan Dierdorf, Conrad Dobler, Bob DeMarco, and Tom Banks and, on defense, linebackers Dale Meinert, Larry Stallings, and E.J. Junior and backs Pat Fischer and Roger Wehrli. Jim Bakken was a standout placekicker for many years and Vai Sikahema a notable kick returner. But the team underachieved far too often, and attendance fell until the franchise shifted again, this time moving to Phoenix in 1988. The overall record over the course of 28 years in the Gateway City was 187-202-13 and 0-3 in the postseason.